Adopting your first cat is a huge step, not to be taken lightly. Although cats have a reputation for independent natures, that fact does not equal "no care is necessary." Before rushing in to buy that darling "purebred" kitten in the pet store window (which is a mistake in itself), take the time to do your homework, to understand cats better by knowing why they do the things they do. That understanding can help you can avoid these common mistakes made by new cat owners. Forewarned, you will also be able to avoid mistakes made by experienced cat owners. The result will be a happier and healthier cat and a long-term companionship with another living being, the like of which you never dreamed. My son and I considered long and hard for weeks before we agreed that two kittens might bring new life to our bored older cats. And we never once considered getting them anywhere other than a shelter. And you know what? We were right. It worked, both for our older cats and these youngsters. If you "impulse-buy" a new purse or a new t-shirt, you can almost always return it if it turns out to be the wrong color or the fit isn't right. No harm, no foul; the purse certainly doesn't suffer from its rejection. But adopting a living, sentient creature such as a cat and kitten, to become a family member, is entirely a different matter. Adopting a new cat should be for keeps, so consider carefully before you make that decision. My husband and I thought long and hard before adopting Billy in 2005. We had seen him several times at our local pet food store on adoption days, and we were worried because he simply wasn't thriving. You'd never know he was actually five months old in this photo. We adopted him three weeks after we first saw him and took him to our veterinarian the following day. My son was in charge of keeping him separate from the other cats for the first week, and today, Billy is HIS cat through and through. Adopting a cat can almost be compared with adopting a child. No responsible adoption agency would release a precious child to someone who was not financially prepared to give him or her the best possible care. While some shelters and cat adoption groups make no such investigation, you owe it to your cat to take care of his basic needs, as well as being prepared for emergencies. 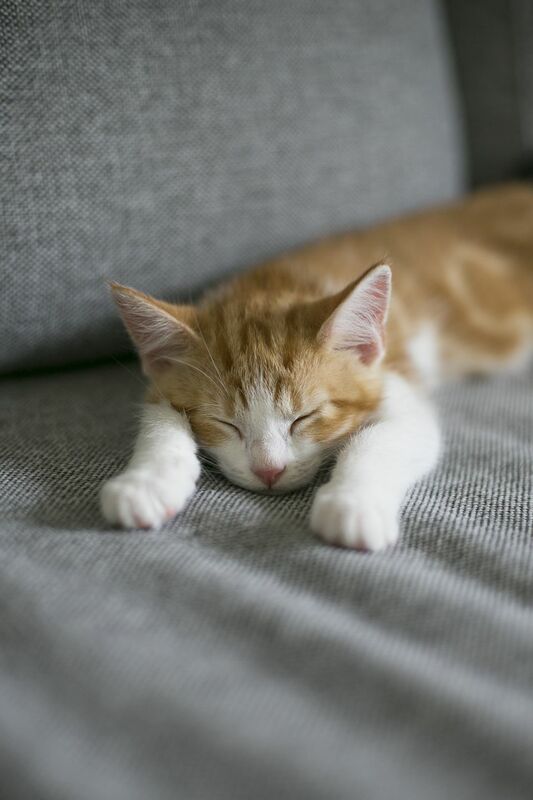 One free tip: Invest in Pet Insurance as soon as you adopt your first cat. It will help save your wallet many times in the future, as your cat develops and grows. Every day I read pleas for help from people who failed to spay or neuter their cats: male cats spraying every available surface of the house or escaping outdoors to fight other male cats; female cats who keep the household awake with their loud yowling during estrus and worse yet, "surprise" litters of unwanted kittens. Could you really afford to raise a litter of kittens? The cost would be much more than spaying that female cat. The overwhelming cat population problem society faces is reason alone to spay and neuter. Add the medical problems averted by S/N and there is no reason not to do so. Although cats may quickly recover from minor illnesses, they can just as quickly die if an emergency isn't recognized. Cats need certain vaccinations, they need annual examinations, and they definitely need and deserve immediate veterinary care when they become sick or injured. Don't delay in choosing (and using) a good veterinarian. Money saved by buying cheap cat food will be spent hundreds of times over on veterinary care. Cats are obligate carnivores and need a good source of meat protein. They do not need large amounts of grain fillers, especially corn, which is a cheap source of protein used by many cat food manufacturers. Learn how to choose cat food and select the best brands you can afford. You'll find your cat may eat less of the high-quality food because they don't have to gorge to get the nutrients they need. Many an innocent new cat owner has been led down the declaw path when a veterinarian asks, "Do you want your kitten declawed when we spay her?" Some veterinarians consider declawing a "routine" surgery, while cat advocates consider it cruel, inhumane, and unnecessary in almost every case. Declawing is not a matter of "trimming" cats claws. It is the surgical amputation of the first joint of the bones in this drawing. Learn the facts so that you can make an informed decision. Many people believe cats deserve the freedom, fresh air, and sunshine of an outdoor life, while many others can offer proof that cats can be very happy and healthy living totally indoors. That the outdoors offers dangers not found inside simply cannot be debated. Fortunately, there are a number of compromises that will give you and your cat the best of both worlds, while keeping him safe and happy. Cats will consistently use a litter box, if it is kept scrupulously clean, and if the litter is not scented or unpleasant to the cats' feet. Carefully maintaining your cat's litter box will almost guarantee you that you will not be faced with litter box avoidance problems. Caveat: If your cat suddenly starts urinating outside the box despite your careful maintenance, you should immediately suspect a urinary tract problem, which is a veterinary emergency. When you join the ranks of cat lovers, you'll soon find that we commonly refer to our cats as family members, rather than "pets." While cats may legally be considered "property" in some jurisdictions, the term ends there. You can no more "own" a cat than you can own another human being. If you haven't figured out the distinction by now, your new cat will let you know in quick order. In fact, many cat lovers describe themselves as being owned by their cats, as demonstrated by the accompanying photo! A cat is not a child, and a cat is not a dog. Cats' unique ways make them the endearing creatures they are. On the other hand, some of their traits may cause frustration because we don't understand their needs. Cats instinctively seek out high places and sharpen their claws because they are cats, not because they are stubborn and disobedient. Our job is to accommodate those needs in acceptable ways.